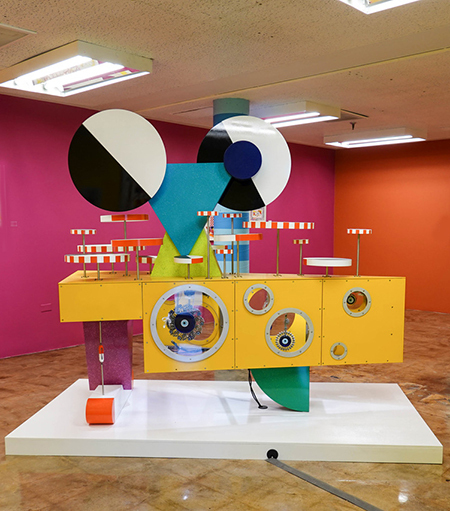 Approaching the museum, visitors see four towering multi-color metal sculptures by Peter Shire, a Los Angeles-based artist and founding member of the Milan-based Memphis design group. It’s a playful hint at what’s exhibited inside: works that explore the origin of dazzle camouflage, and consider its ongoing influence on contemporary art and design. British artist Norman Wilkinson created dazzle camouflage using bold designs and colors during World War I. The idea was that patterns that crossed and interrupted each other were applied to British warships in order to disrupt the enemy’s visual field when they tried to target them. An interactive installation, inspired by Orchestral Manoeuvres in the Dark’s 1983 “Dazzle Ships” album, anchors the main gallery. The exterior features an iconic dazzle design: black and white stripes painted along opposing diagonal lines. Inside, one sees OMD performance video, plus videos by OMD-inspired artists. Peter Saville’s drawings used for the Factory Records album cover hang nearby, as do several album covers and headsets for sampling OMD’s evolving sound. Smaller gallery spaces help visitors take a deeper dive into dazzle camouflage, and how it impacted the trajectory of 20th century design. A 2015 documentary film, “Deception by Design,” explores Wilkinson’s work. Shire’s large, kinetic “Hollis of Fame: The Ship Sails On” (2018) dominates another room. Most striking however is “Dazzle Camouflage (for Peter)” (2008) by Brooklyn-based artist Carrie Schneider. The photograph features a canoe painted with a black and white dazzle pattern, set on tranquil Finnish waters. Fabric collage works by Japanese artist Miho Shimizu and an installation by Ohio-based artist Natalie Lanese are examples of the wide influence of dazzle camouflage and Memphis design. Coming from the source itself are wood and plastic laminate furniture, as well as porcelain and glass vases by Ettore Sotttass, the Italian designer and architect who also helped launched the Memphis design group. There is a subtext throughout questioning gender stereotypes, scientific hubris, and consumerism, assuring this fun visual romp is also a thoughtful critique of 20th century social assumptions.